Rediscover the rosary as a form of contemplative prayer. Designed for both communal and individual recitation. In his apostolic letter on the rosary, Pope John Paul II specifically recommends the use of icons in praying the rosary. The CD-ROM component of A Contemplative Rosary features stunning, full-color icons for all 20 mysteries of the rosary. Commissioned especially for this project, the icons were written by iconographer Charles Rohrbacher. The CD-ROM lets you project the icons onto a wall or screen, allowing small or large groups to clearly see and meditate on them throughout the prayer. 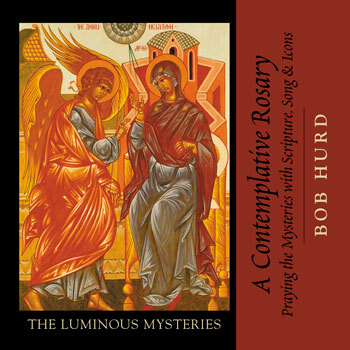 Inspired by Pope John Paul's apostolic letter on the rosary (Rosarium Virginis Mariae), Bob Hurd and friends have created a resource that invites us to rediscover the rosary as a form of contemplative prayer. Designed for both communal and individual recitation, A Contemplative Rosary engages the whole person through music, Scripture readings, icons and meditations. The books also contain three enlightening essays: one by Bishop Michael Warfel of the Diocese of Juneau, Alaska, reflecting on the papal encyclical, which inspired him to initiate this project; "Incarnation and Icon," by Charles Rohrbacher, explaining how icons can help us "encounter" the living God; and a helpful overview and introduction by Bob Hurd, with suggestions for getting the most out of this resource. Meticulously prepared, beautifully designed and revolutionary in its approach, A Contemplative Rosary can help Christians everywhere "contemplate Christ with Mary" through singing and praying the sacred mysteries of the holy rosary.